This Charming destination is only two blocks from South Beach, two blocks into downtown and a few blocks from the park, yet on a dead end street away from the hustle and bustle. This convenient location offers great walking, hiking, biking, beaching, shopping, games, and family cookouts. Enjoy the convenience of this location yet enjoy it's quiet and relaxing setting of home. New for 2019!!!! We have completely redecorated this apartment. The bedrooms boast new bedroom sets. The living room is to be newly refurnished with living room furniture and a sofa sleeper. We have a new large upper deck! Wait til you see the beautiful private deck where all 5 of you can sit and enjoy the outside. There will be a grill on the deck for easy grilling. It's a really great new feature for this unit. Beaufully decorated and furnished: Designed and owned by a Residential Designer, great care was taken to give you the perfect home away from home. We want you to come and feel like part of the family with a quaint and lovely place to stay. 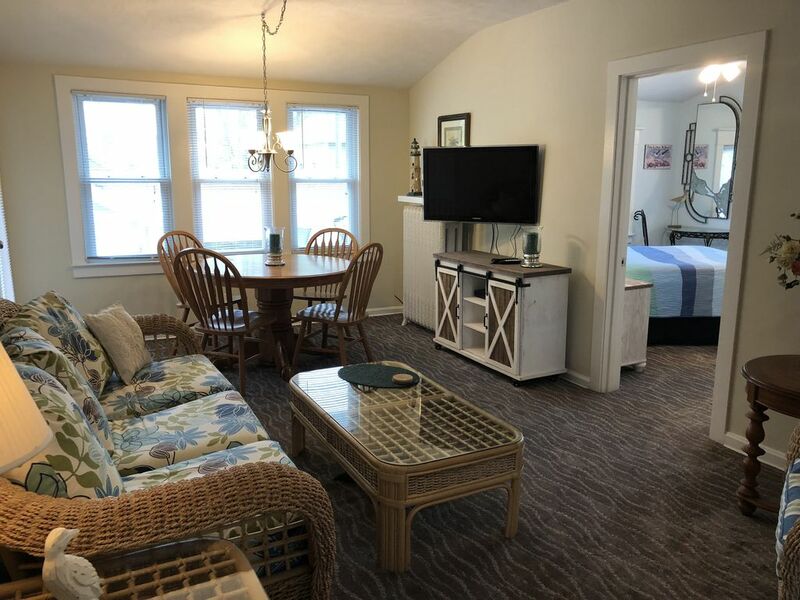 With the beach and town just two blocks away, enjoy the easy access to the beautiful town of South Haven. Hear the waves crash the beach at night while you lay in bed or listen to the music on Thursday evening at the Marina from your private upper deck. The upper deck features a grill and seating to enjoy some outdoor seating. Nearby fun! : The Kal Haven trail is just one mile away. You can ride bikes(can rent them a few blocks away if needed) to the trail or Kayak up or down the Black River. There are a couple of levels of Kayaking I can give you for ideas. This is a beautiful trail. In the winters, you can cross country ski or Snowmobile the trail. Take a picnic lunch and stop by the gazebo along the way. This location can not be beat! All who stay with us love the close proximinty to all! We are a builder and a Home designer who have been living at this address for 12 years. We have taken great strides in remodeling this beautiful home! We hope the guests that stay here will enjoy staying here! Let this be your home away from home! The location and architectural features of this building attracted me to this area. I love Lake Michigan and hearing the water at night. The proximity to town and the water are perfect. The charm and character of this building brought a strong sense of home to me. The bathroom adjoins both bedrooms. Ceramic tile walls and floor. This is a charming bath. A short walking distance to Lake Michigan and South Beach. You can see the masts go by from the front lawn. We are just one street south of the Marina. You can hear the water and see the lake down the road. Bed linens and bath towels provided please bring your own beach needs. One off street space is provided. Other parking on street parking on North side of street. One space provided in lot. Lawn area for family play time. New this year is a larger upper deck with grill and increased seating! We provide your basic linens but ask that your bring your own beach towels, chairs and toys. Gorgeous property inside and out! In the heart of everything. Walk to beach and town. The apartment is wonderfully decorated and appointed, with great attention to quality and function. The private deck is very roomy for a second story deck and a great place to catch the morning sun with tea or coffee. Private entrance and designated parking...it felt like a whole house rental! True South Haven charm! And the proprietors couldn’t be nicer! Hard to leave! Needless to say-high recommendation! My daughter and I had a wonderful vacation stay at this property. It was beautifully decorated, clean, and very comfortable. As we ate most of our meals in, we appreciated the well equipped kitchen. We enjoyed the new outside deck space. One big advantage while staying at this property was how close this apartment was to downtown and the beach. We frequently walked to our destination. I will definitely stay at this property again! Loved it! We were able to walk everywhere we wanted to go. Quiet, nice and clean. My 12 year old daughter and I enjoyed our time at this property. It was clean and comfortable. I loved the big deck with the grill. The apartment is in walking distance to town, the beach and the marina. It was the perfect location. The ceiling fans were great and you could also open the windows for fresh air instead of using the window air conditioners which were noisy to use at night. I would definitely rent this apartment again. It was a wonderful week away at the beach in South Haven, which is my happy place. Heidi was great and answered any questions I had very promptly. Nice place and very convenient. The property was very nice and clean and on a quiet street. So convenient to everything we walked into "downtown" all the time. Loved the private deck we had. Definitely would stay here again. My family had a wonderful time in South Haven. This was the perfect location to enjoy everything! The property was wonderful. We had a great time. We would love to come back! Harbor Fest, Blueberry Festival, 4th of July fireworks, local art shows, Lake Michigan, Marina, South Beach, North Beach, Van Buren State Park, Downtown South Haven, Art galleries. Between St. Joe and Saugatuck- two artisan communities. Golf: Just 35 minutes south is the Newly done Harbor Shores golf course. This is a PGAlevel course. In 2012, the PGA has scheduled a tournament at Harbor Shores. I am the proud designer of the Cottage homes that are being built in Harbor Shores. You will be able to see approxiately 8 of my homes in the Hideway. There are some local courses just north of town a few miles you can golf. Ski: This area is great for cross country skiing and snowmodiling as the Kal Haven trail offers great winter outdoor trails too. We do not do stays less than a week, thank you A 75.00 cleaning fee will be charged A Deposit of 50% will be due upon reservation and the balance must be received two weeks prior to arrival along with a security deposit.